Size: Adult--1" Female Flea Hopper 1/2" to 1/10"
Identification: Small black insects that move around very fast on leaves after being disturbed. They look like tiny little marbles rolling around on leaves. 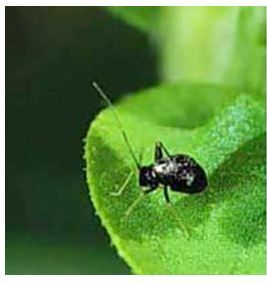 They have long legs and long antennae; they resemble flea beetles but are smaller. Their damage to plant foliage looks similar to spider mite damage. Biology and life cycle: Females insert eggs in the leaves or stems of plants they feed on. Greenish nymphs appear on the underside of leaves in the early spring and grow rapidly into blackish adults. 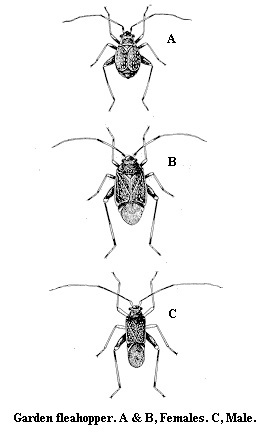 Five nymphal instars (nymph stages between molts). Incomplete metamorphosis. Habitat: Garden plants such as beans, beets, cabbage, celery, cowpeas, cucumbers, eggplant, lettuce, peas, peppers, potatoes, pumpkins, squash, sweet potatoes, tomatoes, legumes, ornamentals, and many weeds. Feeding habits: Piercing, sucking mouthparts; impart a molted look to foliage and destroy the green surface of leaves. Economic importance: Cause severe damage to many crops when allowed to develop into serious infestations. Compost tea and neem are effective. Natural control: Biodiversity, proper garden conditions. Organic control: Garlic-pepper tea when young insects first appear in the spring. Citrus-based sprays for heavy infestations. Insight: This is a classic indicator insect. It becomes a pest only when the plants are not healthy or when site problems exist. We don't see the pest often.